In 1860, Kichinocuke who married Aikana decides to continue to live in Amami Oshima. And Yuta tattoos her on the back of the left hand. It is for married women and said to protect her new family. Yuta tells her to remember the pain while being tattooed (**). Kichinosuke doesn't know what happens in Satsuma. The story dates back to spring in 1859. 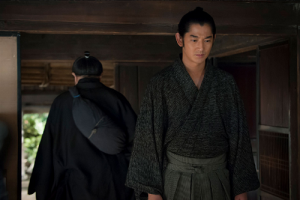 ŌKUBO Jiemon and Fuku, parents of Ōkubo Shosuke move to another place and tell Masu to get along with Shosuke though he likes argumentative discussion but Fuku says he never does so to her. Then his parents tells him to do his work without a hitch but Shosuke who considers how Satsuma domain should be says it is hard to do so now. Jiemon tells him to do everything as he wishes. 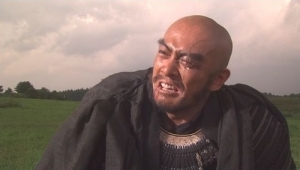 And SHIMAZU Narioki, grandfather of Mochihisa who is the lord of Satsuma domain still holds real power and intends to obey the Tokugawa shogunate. 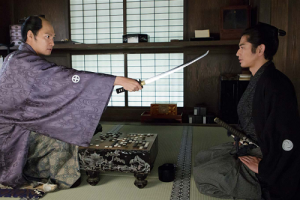 Shōsuke considers what to do while playing go with Shinkai, chief priest of Kisshōin Temple though other samurais of Seichū-gumi(***) practice swordsmanship. They obviously oppose Narioki but Shosuke says that he respects him who never ordered Kichinosuke to commit hara-kiri. Especially ARIMA Shinshichi and ARIMURA Shunsai disagree with Shōsuke and blames him that he often meets Narioki secretly. Indeed he meets Narioki but he intends to report him what "nisé", young men of Satsuma domain think. Narioki introduces him to Hisamitsu and tells he likes playing go. Hisamitsu plans to play it with him but he doesn't let him have credit for it and wins the game. Hisamitsu asks him what he thinks and doubts whether he is really a friend of Kichinosuke or not because what he does is political. 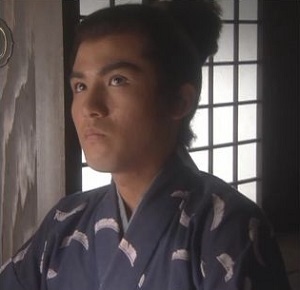 Shōsuke advises him to say opinions to the shogunate when the time comes. The "time" means after the death of Narioki. 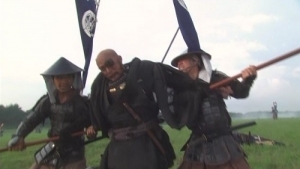 Hisamitsu thinks the words of Shōsuke who is from low-class so impolite and holds his sword to Shosuke's face. 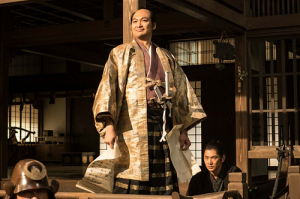 But he declares that Hisamitsu is the only man who succeeds the will of Nariakira and no vassal disobey the order of "kokufu", the father of the domain. Hisamitsu is pleased with his behaviour. On one hand, his wife Masu is invited to a cherry-blossom viewing party for the wives of the vassals held by O-Yura. She sighs over Hisamitsu who continues playing go but Masu tells her that those who likes playing the game is skilful in politics such as Toshō Daigongen (Tokugawa Ieyasu). O-Yura is satisfied with the words and gives her one of her Japanese spaniels. Masu returns home with it and tells Shosuke that she was invited by O-Yura but he warns her not to attend such an event. Masu cannot show him the dog and asks SAIGO Kichijirō and Kumakichi to keep it for a while. "I will die soon and you must feel happy with it." "Nagai aida oyatto-sâ de gozaimoshita" (Thanks for having ruled Satsuma domain for a long time) in Satsuma dialect. 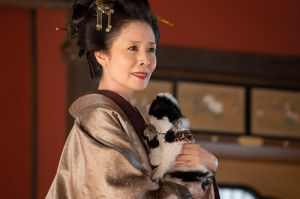 One day O-Yura visits the house of Shōsuke and surprises Masu who carries her son Hikokuma on her back. She, espacially her clothes attract the neighbours and enters the house to take back her spaniel. So Kichjirō and Kumakichi who hear it run to their house to bring the dog to O-Yura. As she misses Narioki, she hopes to keep it by herself again (****). Shōsuke who returns home is surprised with her also. 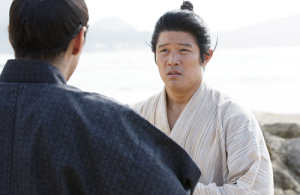 As he is afraid that it would cause trouble and tells Masu that she cannot understand what she did perfectly. Then she tells him that she wants to learn about the affairs of the domain such as he talked with Kichinosuke even just a little bit. 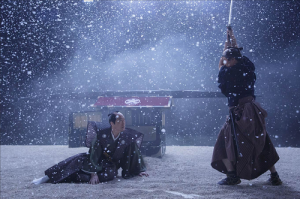 At that time the younger brothers of ARIMURA Shunsai write to Seichū-gumi about the Ansei Purge and it makes many samurais attempt to leave the domain and kill II Naosuke. Hisamitsu (centre) visits Kisshōin accompanies by Shōsuke (right) and reads the paper aloud to persuade the members of Seichū-gumi. Shōsuke tells them to wait because leaving the domain is the last resort and reports it to Hisamitsu. Shōsuke hopes to ask his son Mochihisa, lord of the domain to write a paper that persuades them and hands him a draft. Later Hisamitsu visits Kisshōin and reads it aloud in front of the members of Seichū-gumi. However some of them includes Ōyama Kakunosuke visit his house. They ask him whether he suggested an idea to Hisamitsu or not but he keeps silent. Then MURATA Shinpachi finds a paper he hides but it is not the report to Hisamitsu but the petition for making Kichinosuke return to Satsuma. Shōsuke realises the importance of the existence of Kichinosuke keenly and they except for Shinshichi agree with him. 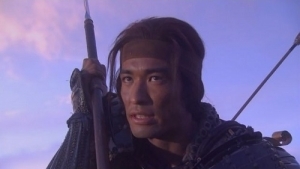 Shōsuke regrets that he cannot unite people like him but Masu loves Shōsuke as he is. He decides to consult her from now on. (*) In go, players with black stones usually makes first move. The words "Kuroi Ishi" in Japanese subtitle mean black stones. (**) Maybe Yuta compares the pain to the responsibility of being wife and mother. 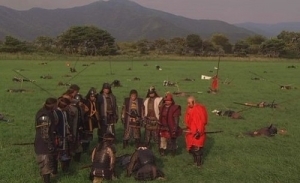 (***) A group of the samurais of Satsuma domain established by Kichinosuke, Shōsuke and other samurais whose purpose is reforming the Tokugawa shogunate but many of them became radical later. (****) O-Yura seems to be a woman of moods but she loves Narioki intently. 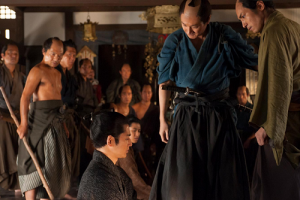 (*****) It was him who beheaded Naosuke but was wounded by his vassal and could not move any more.